OKLAHOMA CITY, March 18, 2011 -- The Boeing Company [NYSE: BA] today announced the beginning of construction of a second facility the company will lease in Oklahoma City. The new structure is needed to address an increase in the Boeing Oklahoma City work force due to program relocations and growth in the services business at the site. 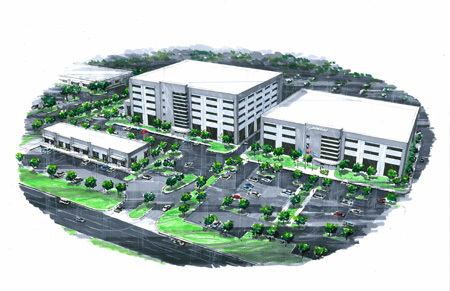 The new six-story, 320,000-square-foot building will be designed and built by the Gardner Tanenbaum Group, a commercial real estate company headquartered in Oklahoma City. The building is expected to open in the second quarter of 2012. In August 2010, Boeing announced plans to move the B-1 program and C-130 Avionics Modernization Program (AMP) to Oklahoma City from Long Beach, Calif.
"By moving B-1 and C-130 AMP to Oklahoma City, we are able to lower our operating costs and extend an increased value to our customer," said Mark Bass, Boeing vice president and general manager of Maintenance, Modifications & Upgrades. "Boeing appreciates the positive business environment created by the state of Oklahoma and its county and city governments. This environment contributes to our affordability, and the well-trained aerospace work force already in place will be key to our success." Boeing Oklahoma City houses programs for two divisions under its Global Services & Support business: Maintenance, Modifications & Upgrades and Defense & Government Services. The site focuses on engineering, contractor logistics services and field support. "Core to our success in the competitive services market is to be affordable for our customers," said Mike Emmelhainz, Boeing Oklahoma City site leader. "We have worked in Oklahoma City to create a business environment that allows Boeing to be affordable and competitive. Our partnership with Oklahoma and the business climate here are helping us win new business, create quality jobs and sustain our current work across all of our businesses." Boeing currently employs 945 employees in Oklahoma, 745 of whom are located in Oklahoma City. Boeing will have nearly 1,500 employees in the state when the B-1 and C-130 transition is complete.